This feature follows on from part one and part two, which reviewed the impact of all Test players’ batting. This final part combines the two previous studies and confirms the most impactful Test batsmen of all time, based on the same yardstick of impact measurement. That yardstick is of course Donald Bradman, insofar as his impact value is compared to that of all other batsmen and extrapolated to give an equivalent impact average on the same scale as traditional batting average. The method is as follows. The match impact rating that I proposed previously is expressed as a percentage per Test, e.g. Garry Sobers’ match impact per Test might be worth say 21%, whereas Dennis Lillee might be worth 19%, but those figures don’t really mean much to anyone else but me as there’s no real frame of reference. So what I decided to do was to a) separate out the impact solely based on each player’s batting, then b) extrapolate that to a value which is equivalent to the range of Test batting averages, with the intent being to provide a rating scale with which those who follow cricket would be familiar (I may at some point in the future repeat this exercise for bowling and fielding). I assumed that the obvious basis to scale from is Don Bradman. As was seen with my full impact exercise Bradman is the highest rated pure batsman (no adjustment for opponent) and as a result will have the highest impact purely from batting, so we can use his batting impact rating and Test batting average from which to scale. In order to scale the other batsmenI had to first run Bradman’s batting impact separation first and this gave me a figure of 22.06% – that is the equivalent impact average figure based on Bradman’s batting alone which is equated to his batting average of 99.94. In this way, once I ran each player’s batting impact I could then scale it to an equivalent batting average scale by comparing it to Bradman and basing it on a batting average of 99.94. So without further ado, below is the list of the top 30 most impactful Test batsmen, based on match impact transposed to an equivalent impact batting average and the yardstick of Don Bradman’s impact. The above shows Player Rank, Player Name, Equivalent Impact Batting Average, Actual Batting Average, Percentage Increase/Decrease, Number of Tests and Test Career Duration. I’ve included the duration of their careers for comparison as opposed to simply number of Tests, as many more Test matches were played in Dravid’s modern times as compared to Trumper and Jackson. As we can see, Trumper’s impact was massive as compared to his batting average, and his equivalent average is now comparable to all of the players listed above. Bruce Mitchell is rarely if ever mentioned among the Test batting greats, however his equivalent impact average is higher than all of the batsmen so far listed. Of his debut innings in England in 1929, Wisden noted ‘As an exhibition of patience and restraint, his innings was quite remarkable.’ His most famous innings however was his 164* at Lord’s, an innings which was ranked as the 14th best ever Test century in Masterly Batting, wherein it was described by Richard Parry as ‘an innings of patience and determination, the ultimate acceptance of responsibility by a man who was able to lift his performance and to seize the moment. Not only that, his innings was filled with classic batting from a talented natural stroke player who had built his international career restraining his attacking instincts in the service of a weak team.’ At that time, Mitchell was ranked third in the world according to the ICC Rankings, behind only Bradman and Headley and ahead of the likes of Sutcliffe, Hammond and McCabe. Four all-tme batting greats here…and Aubrey Faulkner. Faulkner is widely considered as one of the best ever all-rounders, however he was so dominant that he was separately ranked number one as a batsman, bowler and all-rounder during his Test career. In fact, his career-best ICC batting rating of 877 is better than was ever achieved by Rohan Kanhai, Colin Cowdrey, Graham Gooch, Inzamam-ul-Haq and Glenn Turner, among others. Nice to see Neil Harvey well represented here by his equivalent impact average – his batting average sees him ranked number 50 all-time (20 Tests minimum), whereas measured by his actual impact he ranks 18. Hammond, Chappell and Sobers are less affected and rate equally well whether impact or batting average is considered. George Headley is negatively affected as regards impact, as was his batting average, by continuing to play after World War II, when he was aged 45. Had he retired after 1939, his batting average would have been 66.72 as against his final average of 60.83; considering his equivalent impact average, the difference is 68.18 as against 58.12 – that impact average of 68.18 would have ranked him second of all time behind Bradman. Graeme Smith, described by CW’s Gareth Bland as a colussus, was responsible for three of the highest batting impact matches of all time, culminating with the 154* at Edgbaston which ranked number three of all time in the aforementioned Masterly Batting – Rob Smyth’s account in that book was described in the book review section of the 2014 Wisden as ‘one of the best pieces of cricket writing of the year, in any medium.’ As the following extract shows, the plaudits are well deserved:- ‘On a personal level, Smith upgraded the archetypal captain’s innings for the 21st century. It had all the over-my-dead-body qualities associated with the genre, but its purpose was victory rather than the avoidance of defeat…Smith bent a match, a series and even history itself to his granite will’. I recently watched the Sachin biopic and, my goodness, he looks breathtaking in full flow. One of the criticisms of Tendulkar is that he didn’t get it done when it mattered, but a 9.34% increase over his batting average would suggest that this is an overstatement. He also rates ahead of many batsmen who outrank him in the ICC Player Rankings. Tendulkar is slightly behind his countryman Sunil Gavaskar in terms of impact. 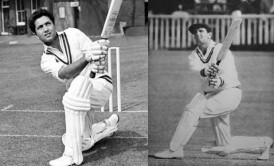 Hobbs and Lara receive very large improvements based on impact, Hobbs now ranking ahead of his long-time opening partner Herbert Sutcliffe, which is not the case when batting average is used as a measure. A comparison of the impact top 30 ranking against the top 30 when ranked by batting average shows 20 of the impact top 25 also appearing in the batting top 30, 9 of the top 10 and all of the top 5 repeated, though the order is somewhat different – the correlation coefficient is about +0.5, which is halfway between an exact match and no match at all. While those numbers might suggest that the impact average is not providing much more information about actual impact than is the batting average does, this can be further investigated by reviewing those batsmen who have gained or lost the most in the comparison. The lists below show the top movers in terms of difference between impact equivalent and batting average, both positive and negative. The above suggests that the impact measure is offsetting any era scoring differences. Voges benefits from often coming into bat with his side well in front, so it’s not surprising that his equivalent impact average is significantly inferior to his batting average. I admit to being quite surprised by ‘Long’ Tom Graveney’s presence on the above list, we’ll discuss that in more detail later. In terms of batting average, Walcott is far ahead of Trumper, 56.59 to 39.05, whereas in terms of equivalent impact average Trumper’s is slightly higher, 53.82 to 53.73. While some of this may be explained away by era differences, the increase/difference lists suggest otherwise, and in any case is certainly not true for the following two comparisons. Barrington’s average is more than ten runs higher than Harvey’s, 58.67 to 48.42, whereas Harvey’s impact average is higher than Barrington’s, 55.59 to 54.95. Zed averages 44.80 which compares with Turner’s batting average of 44.64, but impact-wise Turner is far ahead, 52.46 to 40.91. The second and third comparisons cannot be explained by era scoring differentials. As regards the various movers up and down, the one which surprised me the most was Graveney. When I was younger, my dad spoke highly of Tom Graveney and I therefore held him in high regard myself, plus most of what I read of him lauded his elegant and stylish batting. Given that the impact measurement downgrades him significantly, I decided to compare Graveney with a batsman from the same era having a similar batting average but a higher impact measure, namely Hanif Mohammad. Graveney played from 1951-1969, while Hanif debuted one year later and retired the same year as Graveney. As regards batting average, Graveney’s was 44.38, Hanif’s 43.98. However with the impact measure Graveney rates at 38.01, Hanif at 52.37, a massive difference. The above shows the batsman’s own team’s win probability on coming into bat, number of innings, not outs, batting average and 100s/50s under each situation, for each match scenario of ahead (0.6-1.0), balanced (0.4-0.6) and behind (0.0-0.4). We can see that Hanif performed at a much higher level than did Graveney when the chips were down, whereas Graveney did much better when his side was ahead and there was less pressure to perform. We can see clearly that Hanif was a far superior performer under pressure, with twice as many centuries scored in only a few more innings. Granted, Pakistan was a lower quality team than the England team of the period of Graveney’s Test career and was not ahead very often when Hanif came in, but nonetheless Hanif clearly turned it on when it mattered most. Martin Chandler’s piece on Long Tom revealed an interesting fact – in the first 55 Tests of Graveney’s career, played when he was between the ages of 24 and 36, Graveney scored 3107 runs at 41.02; after a three-year gap with no call from the selectors, Graveney returned for 24 more Tests between the ages of 39 and 42, and knocked up 1775 at 50.71, an increase of 9.69 runs on his average during that period. Was that difference in fortunes also reflected in his impact measure? His first 55 Tests were worth an equivalent impact average of 31.89, while the final 24 were worth 50.06, for a differential of 18.17, so the answer is a resounding yes. Yet Graveney did give the selectors cause for doubt. After his second Test, in which he untypically laboured for more than eight hours to amass 175 against India in Bombay at the end of 1951, he failed for many years to live up to his potential for England. To some he appeared too relaxed to steel himself to the rigours of Test cricket. In particular, Graveney fell short in moments of crisis against Australia, the ultimate test for England batsmen. In 22 matches and 32 innings against Australia he would score only 1,075 runs, at an average of 31.61. Against the West Indies, by contrast, he made 1,532 runs in 31 innings, averaging 58.92. The whisper went around that Graveney lacked the strength of character to succeed when the going got tough. While those batsmen who fashion a high batting average typically have significant impact also, as this study has shown this is not always the case and there are batsmen whose batting average does not tell the full story of their contribution. I feel that the results discussed above have positively highlighted those batsmen who can be relied on to save or turn a match when called upon. Which was the point all along.